Domaine Marc Roy is a wonderful gem in our portfolio – minuscule domaine (only four hectares!) 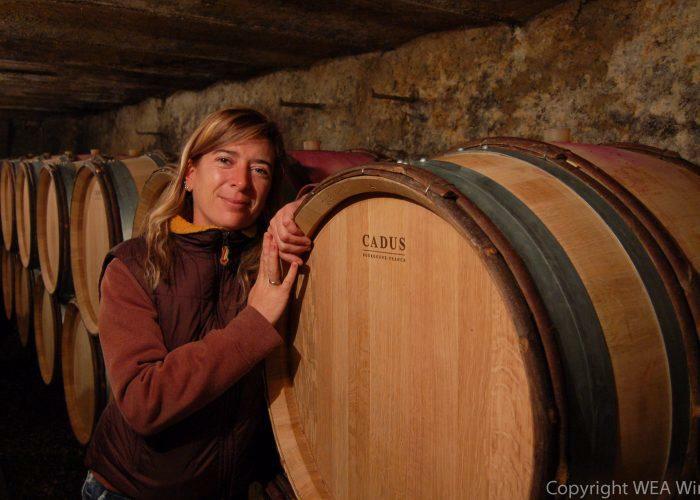 run by a young, enthusiastic woman (Alexandrine Roy)... Alexandrine, the fourth generation at this family domaine, does everything herself -- including pigeage by foot! --and the wines are very pure expressions of both her winemaking philosophy. Alexandrine's light touch with vinification results in remarkably pure, supple, and gorgeously silky wines; she destems 100%, uses oak conservatively (and based on the character of a given vintage--nothing is done by rote), employs relatively brief elevages (around one year in wood), and cherishes purity and elegance above power. She says: "I like classic pinot noir; too much color and extraction is not pinot." Alexandrine's wines are very distinctive: the Marsannay does not go through malolactic fermentation, and retains a refreshing acidity; the Gevrey-Chambertin Villages is from 70 year old vines; her "Clos Prieur", from 50 year old vines; and the tiny-production "Cuvée Alexandrine" is made entirely from millerandaged grapes -- small, thick-skinned, ultra-concentrated berries that occur with greater frequency in excellent vintages.